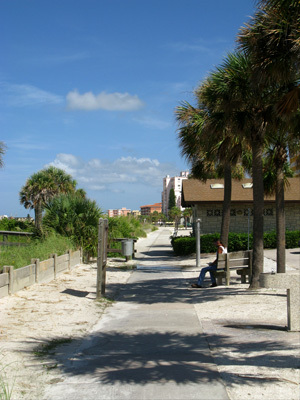 The Treasure Island Beachtrail is a beautifully paved walkway on Treasure Island FL that parallels the beach for about a mile. 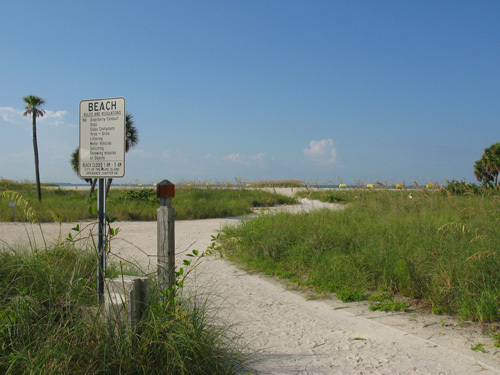 It is used by young mothers with strollers, retirees, and visitors on a Florida beach vacation. 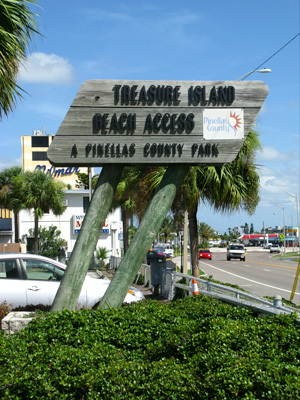 Sometimes called the Treasure Island Beachwalk, it provides a scenic tour on a short stretch of the beach. There have been plans for expansion, but they have been stalled by both budget concerns and controversy. 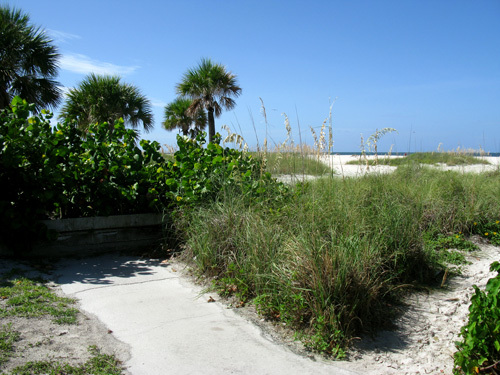 The trail starts at the County Park Beach Access at 104th Avenue and ends at the Marriott Hotel near 120th Avenue, to the north. 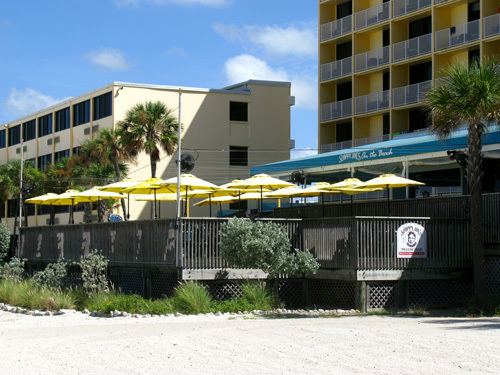 It is a double-wide smooth concrete path, running behind the sand dunes, that allows easy movement between several hotels and beach bars that are fronted by Gulf Blvd. You will find many walkers out here both in the mornings and at sunset, as well as parents with children who are just learning to ride a new bike. It is a casual, enjoyable, and beautiful walk. The Beachtrail starts pretty much right here at the parking lot on 104th Avenue. The start is a kind of abrupt looking. Don't let it bother you. The view gets more scenic with each step. To you left you'll see the super-wide beach of Treasure Island. 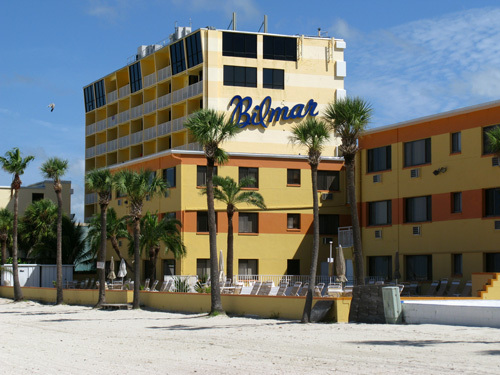 The first thing you'll notice is the colorful Bilmar Beach Resort. 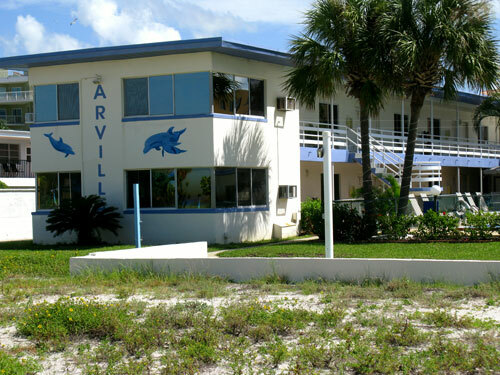 One of the premier Florida beach vacation resorts on the Gulf beaches. 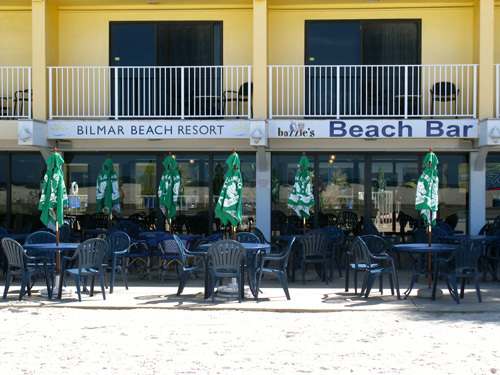 I like it because it is connected with two great beach bars. while, Bazzie's Beach Bar is a bit more upscale. 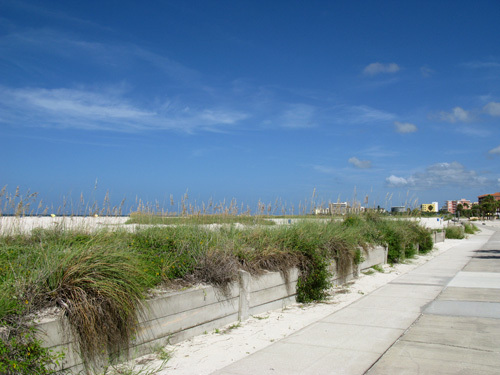 The west side of the Treasure Island Beachtrail has a small boundary wall, beautified with natural plants. 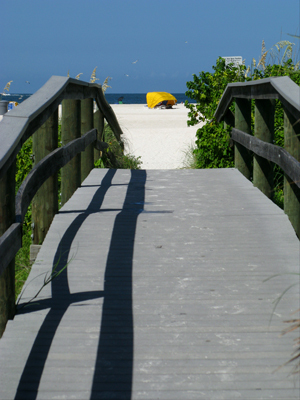 It is tall enough to keep sand off the trail, but low enough to provide a nice view of the beach and Gulf. 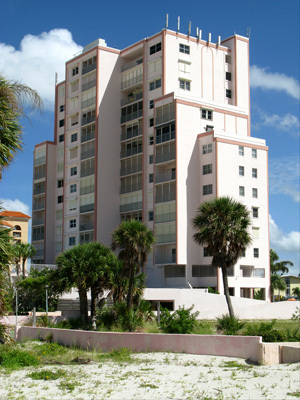 The tallest building on the beach is the Treasure Sands Resort Hotel. You'll notice it pretty quick. 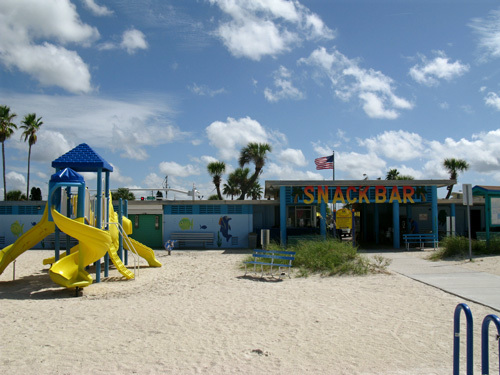 The Treasure Island Municipal Beach Snackbar is a popular place on hot summer days. 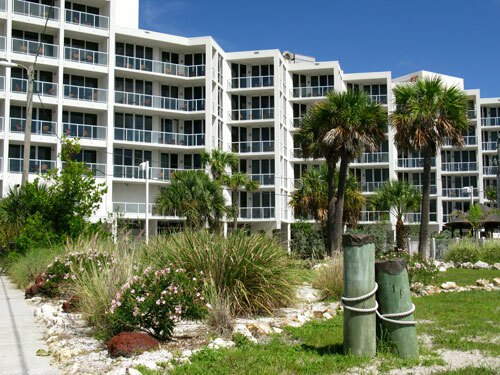 It has picnic tables, a playground for youngsters, and restroom/outside shower facilities. The mailbox at Tropic Terrace Motel has taken a lot of people by surprise. People ask me if the Post Office carriers really come down here to get the postcards being sent. What do you think? 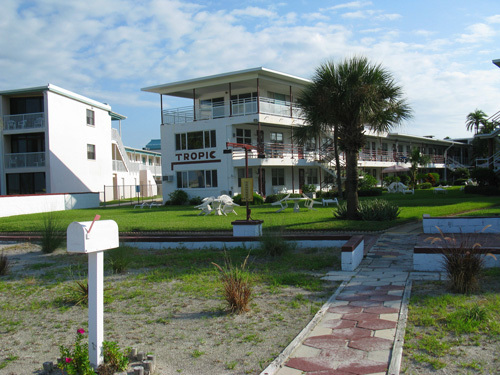 This is a great little motel with an Old Florida feel and extremely good rates. You can reach them at: (727) 367-2727 or (877) 255-9988. Our tour of the Treasure Island Beachtrail has come to an end. This little beach garden behind the Voyager Beach Club Resort is pretty fitting. The trail forks here. ...turn right, and you'll be taken out to 120th Avenue and Gulf Blvd. A glance to your left from there will let you see the famous Treasure Island Shake Shop. 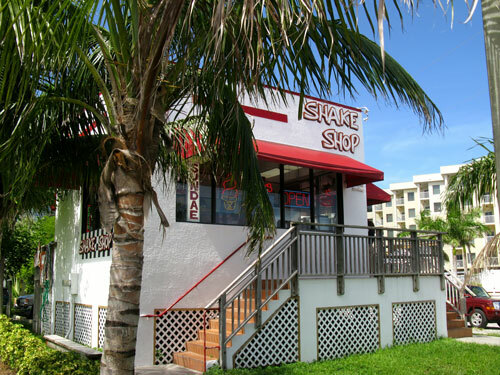 It is a great destination for dessert after eating at Sloppy Joe's Beach Bar. Hopefully, the Treasure Island Beachtrail can be expanded to John's Pass on the northern end and Sunset Vista Park to the south. Below is a link to the controversial plan. To me, it seems like a good thing, but some residents vehemently oppose it.